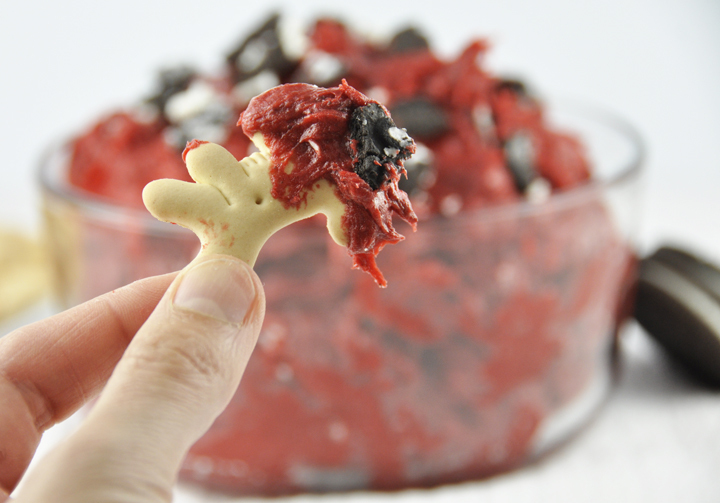 Red Velvet Oreo Cookie Dip made with cream cheese is perfect for dipping apples, animal crackers, vanilla wafers, pretzels, or graham crackers! A great dessert recipe for the holidays – especially Christmas or Valentine’s Day because of the red color! I have a problem………..I am addicted to dips. All kinds of dips, whether sweet or savory. 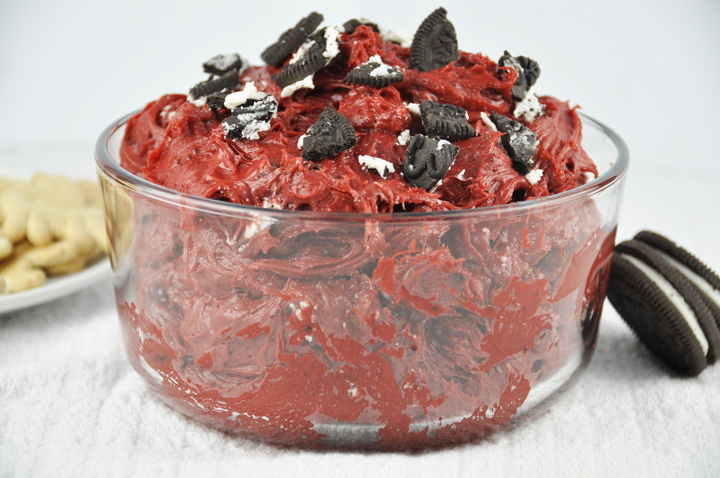 This Red Velvet Oreo Cookie Dip is the best dessert dip I’ve had in a long time and would be an awesome Valentine’s day dessert or snack. It has Red Velvet cake mix in it to give it that rich, fun and festive red color, cream cheese, and Oreo cookies mixed in to really make this unbelievably good! 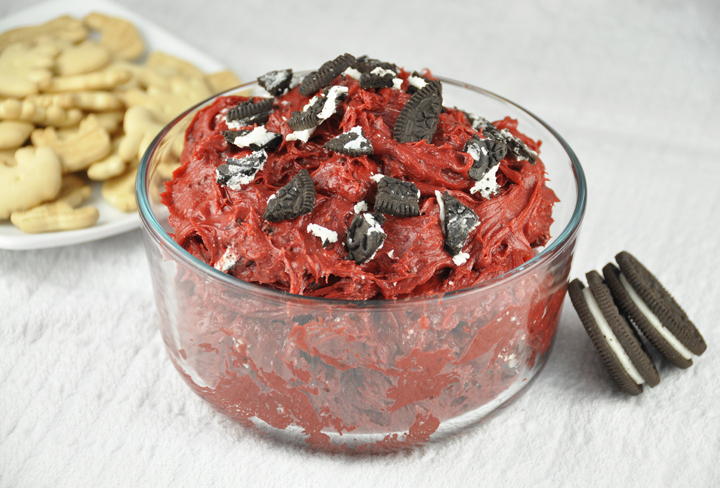 Red Velvet Oreo Cookie Dip made with cream cheese is perfect for dipping apples, animal crackers, vanilla wafers, pretzels, or graham crackers! A great dessert recipe for the holidays - especially Christmas or Valentine's Day! In the bowl of a stand mixer (or use a hand mixer), beat together the cream cheese and butter until smooth. Beat in the red velvet cake mix, 1 cup at a time. Add 2 tbsp. of milk alternately, if necessary, to keep consistency smooth. Whisk in the powdered sugar, 1 cup at a time, alternately with remaining tablespoons of milk. Continue adding powdered sugar and milk until it reaches a consistency and a sweetness that you like. Mix in 8 crushed Oreos. Sprinkle the 2 additional crushed Oreos on top before serving. Serve with your favorite dipper: animal crackers, apples, graham crackers, pretzels, etc. I preferred mine with the large pretzel sticks! I dip my dip in dip. when u dip i dip u dip? I’m all about colors when it comes to food. And this tasted amazing! This one was a winner for sure!! I wasn’t sure it would be good but it was amazing!! Looks so festive and perfect for Valentine’s Day! Oh my goodness Ashley!!! You’ve outdone yourself on this one! It’s so good!! It came out way better than I thought it would. Thanks Nancy! That is too bad! You can always use a yellow cake mix and red food coloring to make it red! What a great Valentine’s Day treat! Ooh, this dip turned out such a pretty color! Wow, that is one delicious looking red velvet dip! I’m loving all your dips! 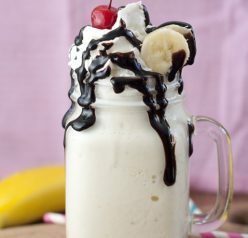 That looks amazing, I could use some right now! Dips are such a weakness of mine – I can’t make them a lot because I always each wayyyy too much! This sounds utterly awesome! 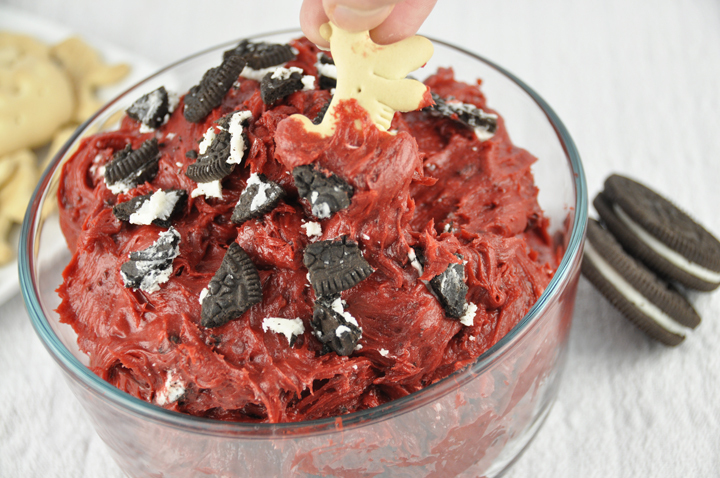 haha Oreos and red velvet … in a dip. Genius! I’m glad you feel the same love for dips! And this dip . . . wow. 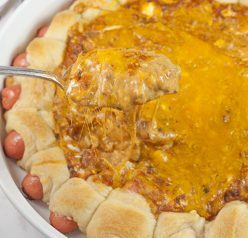 I should just tell my husband to subscribe to your blog, because you post SO MANY recipes that have his name written all over them. 🙂 Red velvet and oreos are two of his absolute favorites! 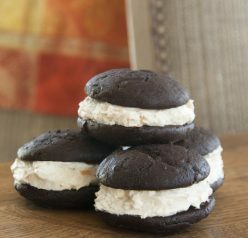 Everything is better with Oreos!! Lol! I wanted to make this ahead of time and didnt have any powdered sugar so I added 1C regular sugar and 2 chocolate pudding cups and left the cookies out, using them for dipping instead. Awesome!